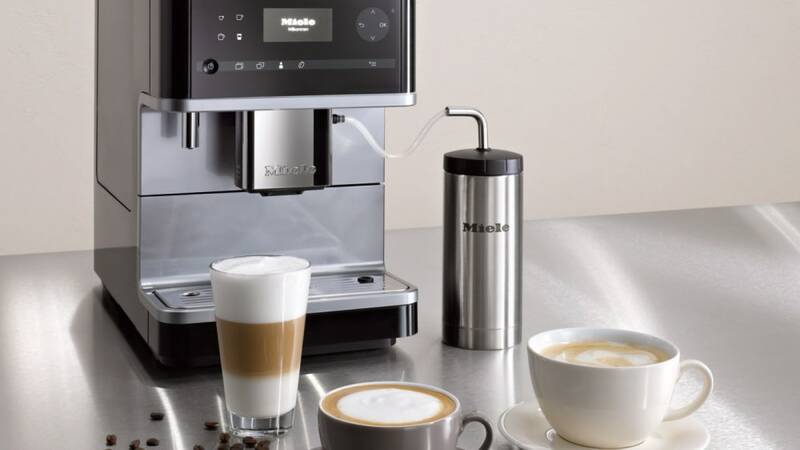 Time to update our Miele CM6 coffee maker review for 2019 following the introduction of the new CM 6350 and CM 6150. There has been a new product release for Miele coffee makers since we first published this article in early 2017. As of October 2017, Miele introduced the new CM6 coffee makers in two rich colors - white and black. Therefore, we thought that it would be a good idea to update this review to incorporate the changes. The main change from CM 6310 and CM 6110 is the Coffee Pot Function which allows you to make up to 8 cups of coffee in a pot. You can now program up to 4 user profiles with individual settings for portion size, strength, brewing temperature and more. Cleaning the machine now became easier with the dishwasher-safe drip tray. As always, brew unit is removable and automatic cleaning programs are there to maintain your investment. Aesthetically, menu bar got a new facelift in all models. In addition, CM6350 now features an elegant stainless steel backsplash. In 1998 Miele introduced worlds' first built-in coffee maker for those who are pursuing luxury and convenience in their homes. In late 2014 Miele made yet another leap with the CM6 countertop coffee makers. A "pocket hercules", this loyal personal barista is there for you to grind fresh beans, apply perfect 15 bar pressure, administer precise amounts of heat and water, froth your milk for a perfect cup of joy. Best of all, your barista self cleans after each session. All with one touch of a button. Consistently. Every time. When you own a Miele coffee machine, you will not run out of filter paper. Moreover, you will have the right to put your friends to shame for feeding the plastic mountain Keurig and its competitors are building. CM6 conveniently offers the following drinks (and their popular variations) Espresso (or my favorite spelling and pronunciation espresso), Coffee, Cappuccino, Long coffee, Ristretto, Latte macchiato, Caffè latte, Hot milk, Milk froth. When making your drink, you can program quantity and temperature of water as well as amount of milk and froth. This product comes with a large water tank (1.8L) and the sealed bean container can hold 300 grams (10.6 oz) of coffee beans. So, what is different between CM 6350 and CM 6150? CM 6350 Coffee maker has a built in hot water spout. This can be handy to instantly heat water for tea or hot cocoa. You will have additional coffee drinks preprogrammed such as ristretto, lungo coffee, caffe latte, hot milk and milk froth. In addition, CM 6350 has a cup warmer on its top surface for convenience. Although, you can purchase the stainless steel milk flask separately on the CM 6150 model, it comes standard in CM 6350. Aesthetically, CM 6350 has an elegant stainless steel backsplash. Attention to detail has always been important for Miele. CM6 is not an exception. As an example, the plastic tube that comes out of the froth spout connects to the drip tray to facilitate cleaning. There is even a compartment to store the plastic tubing to prevent clutter and chaos in your kitchen. These were just a few examples of the thought process that went into this product. Easy Access to the brew unit if you want to give it a good manual clean. You will also notice the hiding place for milk system plastic hose and the grind coarseness setting. All in all, if you are pursuing the best coffee experience you will love Miele's CM6 family of coffee machines. 1- Convenience and instant gratification to make the perfect cup of coffee or espresso. 3- Amazing cleaning ability that ensures great tasting coffee with maintenance free longevity. Commitment to Quality - If you happen to receive this product and notice ground coffee residue don't panic. Miele tests each and every unit before shipping to a customer.